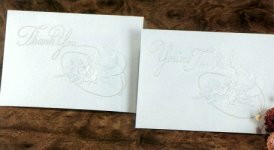 Embossed with a cowboy hat and lariat encircling roses, our Western Invitations and Thank You's continue the charming motif found in many of Cultured Cowboy's selection of Western Bridal Accessories. However, don't limit their use to the wedding -- they are equally appropriate for other occasions. CLICK ON IMAGE FOR LARGER VIEW, ITEM# AND MORE INFORMATION! -- THANK YOU!